One of Momiji's friends who helps Konoha ask her teacher out on a date. She is one of the two people who witnessed Konoha's teacher's attempt to kill Konoha during their date. Mayumi does not appear in the games at all, meaning something may have happened to her before the games took place. 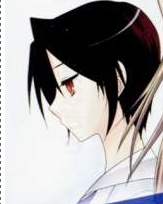 At the end of the manga, we see that she is taking care of a mysterious young girl with long, straight, black hair. Whether the girl is a magus or not is a mystery. The girl also has no significant role in the games.